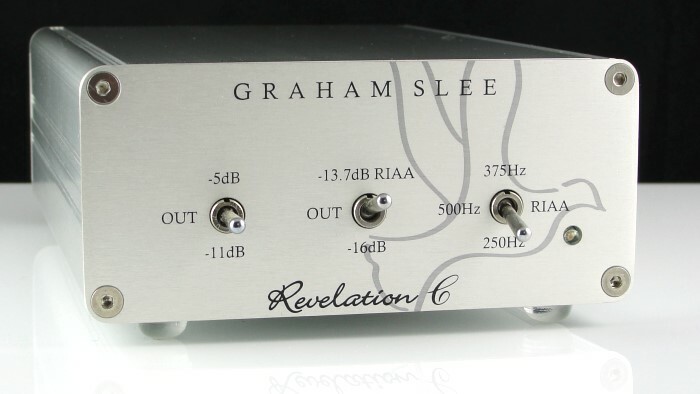 The Jazz Club, Revelation M and Revelation C phono amps offer more than the standard RIAA equalisation required for modern vinyl - they provide the correct EQ for many non-RIAA old phonograph records. With the addition of the Accession phono amp to our range, in both MM and MC versions, it's CA/Flat setting allows reproduction of acoustic 78s with a dramatic reduction in surface noise, as this review on TNT-Audio explains (with illustrative audio clips). 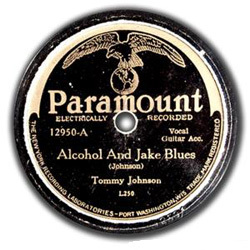 For years I put the muffled tones of a lot of 78s down to the restrictions of the recording techniques of the period. Then I discovered that different manufacturers had used differing amounts of treble or bass in their recordings (correctly called equalisation), and that tone controls were fitted to amplifiers for correction of this. 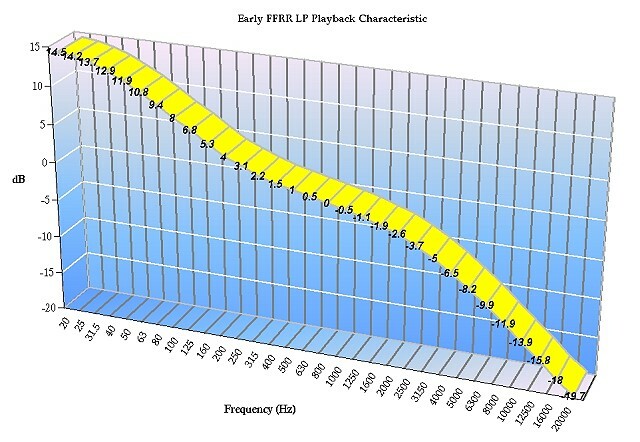 It wasn't just 78s that featured differing equalization - early LPs and EPs did too. 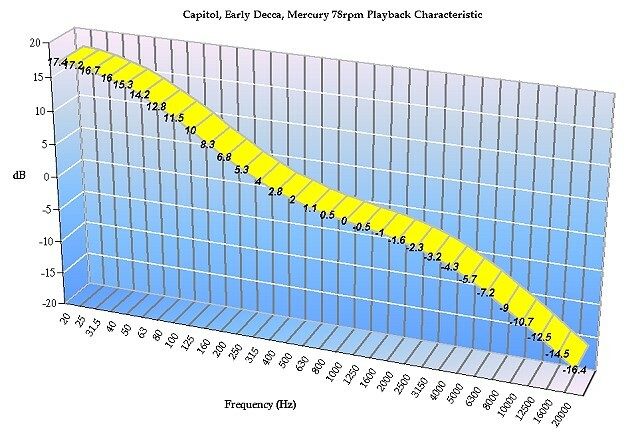 The replay equalisation curves shown on this page are based on research by a number of antique music enthusiasts - the main resource being by Russell Fisher of the Wolverine Antique Music Society. 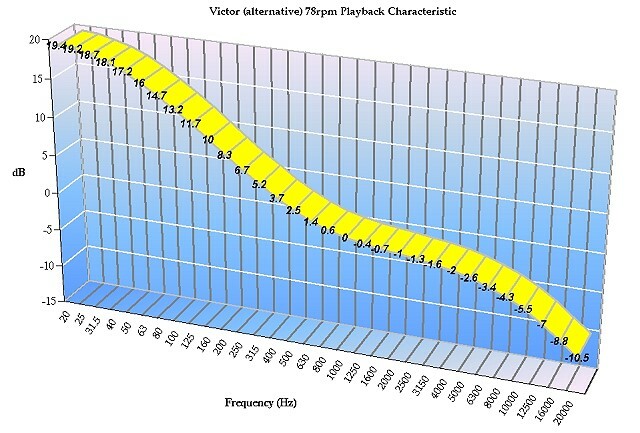 The reproduction curves are not exclusively the inverse of the frequency response of the records, but the inverse of the rising response characteristic present in all magnetic cartridges combined with the frequency response of the records. The reproduction response using ceramic or crystal cartridges will differ greatly and also require a different type of phono preamp. 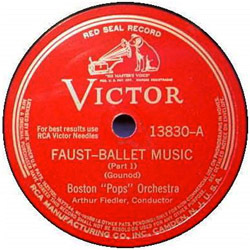 Record manufacturing engineers were involved in obtaining the best "fit" for the 9 octaves the record lathe had to do. 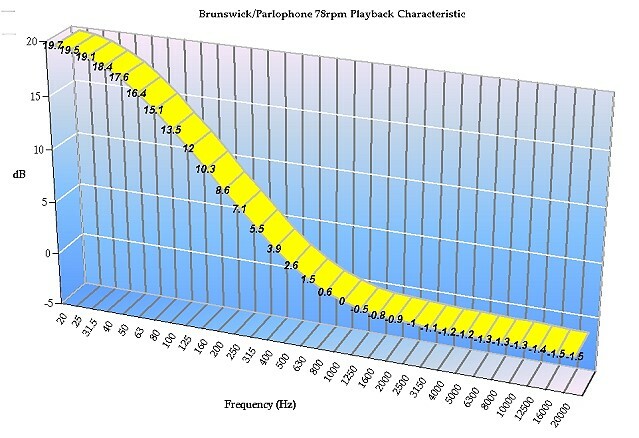 The cutter head response being downward (falling in recorded amplitude at a rate of -6dB per octave) - their job was to increase (or equalise) it to give a flat response on replay. The problem was that the amps they were using didn't have the dynamic range to make it perfectly flat, and so they were doing their best to make it "sound even" on the record reproducing equipment of the day. Each record label had its own idea, and also a little tweaking of the curve could make a record sound sweeter - resulting in more sales. Standardisation didn't seem to matter. However, the charts show an emerging story. You'll note that one label in particular was busy darting about from one EQ to another - possibly trying or researching each record label's EQ? And that label is the Victor label. 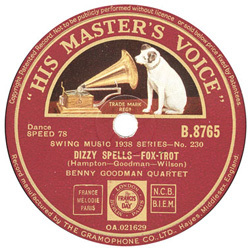 In 1929 the Victor Talking Machine Company (later to become JVC) - the largest producer of phonograph records - was bought by RCA. It was RCA who went on to found the RIAA standard in 1953. The story in the curves tends to suggest that much research by Victor (and hence RCA) toward convergence of all these curves, was taking place. The following record labels are equalised by these switch positions (left to right on front panel). 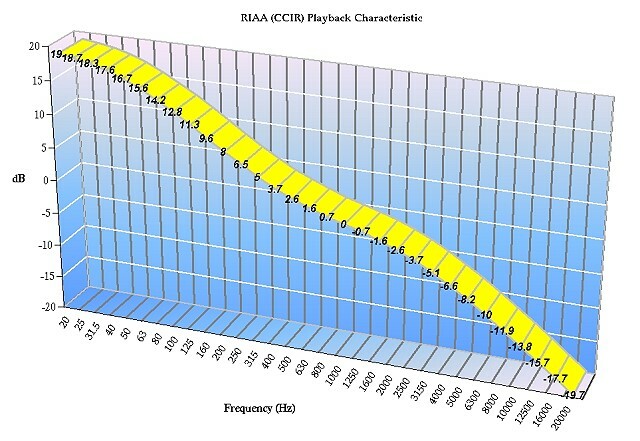 The resulting playback EQ is illustrated in the charts. Can you do a flat response eq curve? Sorry, that isn't possible. Magnetic cartridges have an increasing output characteristic which would require 60dB of bass boost at a rate of 6dB per octave from 20kHz to produce a flat line between 20Hz and 20kHz, in addition to the gain required to amplify the signal. 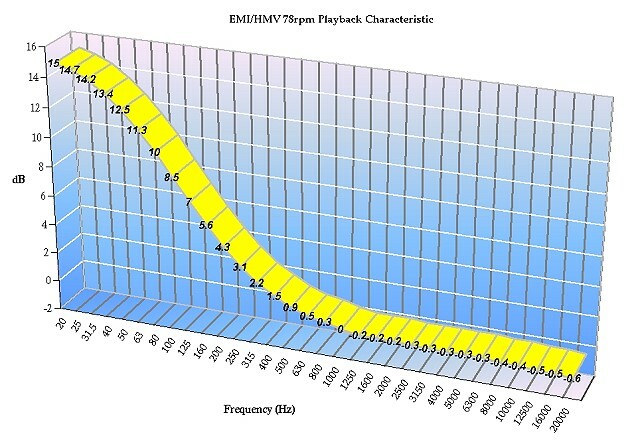 For a moving magnet stage it would require at least another 20dB of gain, and to cover for transients another 14dB. The total so far is 94dB, but then you need at least another 50dB for some signal to noise ratio, and 50dB is poor - modern specifications call for 70dB. Add that and you'd require a stage capable of 164dB dynamic range. 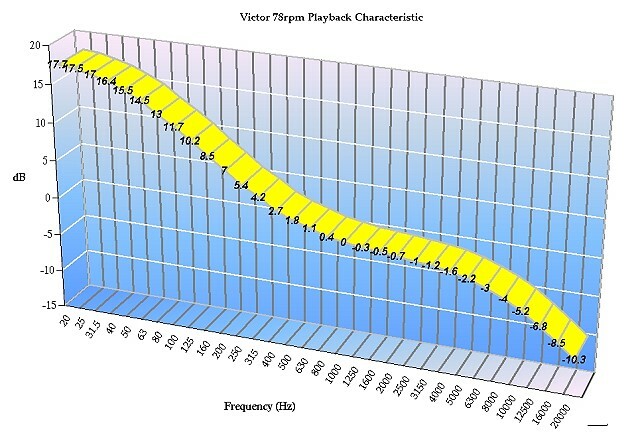 For a nominal output of 500mV that would require an equivalent input noise of 3 pico Volts or a noise figure of 21nV/sqrtHz. Forget about doing it with discrete circuitry, and although there are low noise op-amps advertised with noise figures of around 1nV/sqrtHz, they're dead slow for audio. 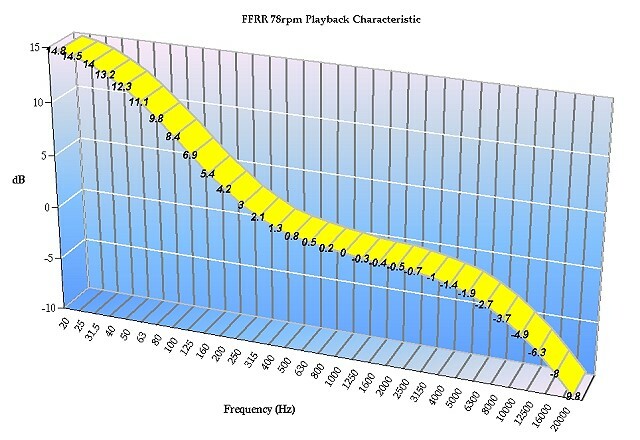 3-5nV/sqrtHz is about right for audio but that's a spot figure at 1kHz and noise grows far worse at low frequencies (the 1/f corner). Even if you could get that to match, it doesn't consider the noise contributions of the rest of the circuit components — a 47k cartridge load resistor swamps that noise figure with more noise. And then when you plug in the cartridge via its arm cable... forget it. Isn't it a bit silly offering a moving coil preamp for 78's? Some of our customers don't think so, and we listen to all of our customers. Some asked for a moving coil version of our Revelation phono stage. We don't question their reasoning, and please also consider that old LP's and EP's will play using a standard low output moving coil cartridge — both the Revelation C and Accession MC reproduce those too, and these customers may have a large collection of those records. Why don't you fit a rumble filter? Let's make this clear: rumble is what poor or worn platter bearings produce. A properly refurbished and maintained 78 turntable of the quality required here should not produce annoying amounts of rumble such that it needs to be filtered out. I'm also sure that record manufacturers would have gone to the trouble to ensure their lathe bearings were serviceable. If you have excessive loudspeaker cone flap, that's down to arm/cartridge compliance matching. A proper arm/cartridge match will result in a resonant frequency below the audio frequencies recorded on the record and above record warp frequencies, and will minimise cone flap. This page by Graham Slee is licensed under a Creative Commons Attribution-ShareAlike 3.0 Unported License.